No, actually, it seems a little easier than the last time out. That said, I'm having a hard time with it. Hitting those DDs from head-on seems nearly impossible, and wandering outside the green line to get an angle is suicide. Plus my Tier 7 ships are getting rusty. It is one of the hardest tier 6 scenario operations, some teams make it seem easy. I have a whole bunch of Tier 6 ships now to give this a go. Try, try, try again. Please, Lord, I will be happy with FOUR stars; but if it be your will, give me five so that the other players can also be happy. Cleveland, Fuso, Normandie. I don't have Budy but see it played frequently. Slow BBs probably okay since they don't have to move much. Gunnery is king. DD not recommended unless unicum. The trick is to kill the incoming waves quickly. If they start to overlap, you're in trouble. Arizona is deadly with her accuracy. Just keep her inside the green circle. The only change I see (except for the new players) is that the final CV does not rush the cap like it use to. It stays back until about 2 mins mark, so you need to have someone rush towards it to spot it. However, when you have a team that does not go out and search for the reds, you don't need to worry about this CV because the enemy comes to you. I find no difference in the game play of this ops. I play it the same way and the results are still rather consistent for me with 4 stars and 5 stars being achievable at about the same rate as I remembered. 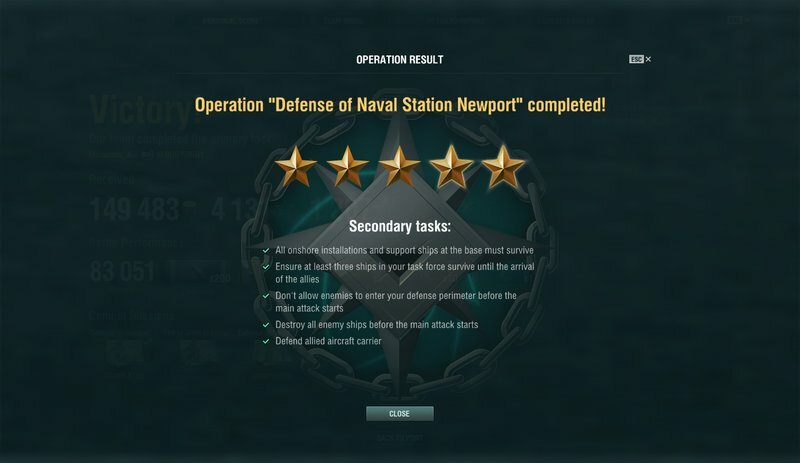 The two biggest reasons I see for not getting the 4 or 5 star wins are by allowing the enemy team to breach the perimeter or being out of position to defend the CV. Almost always this is a result of the team refusing to move beyond the defensive zone. Don't go cray and run all over the map, but having an extra minute or two to kill each wave by moving up a little can make all the difference. Edit: Best ships for me were Cleve, Bud and Leander. 4 & 5 star wins with each. I tried it once last night because I wanted the free xp rewards. Team disappointed. I ended up the last die. Got first place but mission failed. Looked up the stats of the players on the team. Was a mixture of Random and Co-op mains. Didn't bother trying again afterwards. Went back to co-op. Not worth the aggravation to try operations again at this time. If you see me in later tonight, ping me and we can at least coordinate between us. ** Disclaimer: I have been made aware there are exceptions. However, I have yet to personally see it in battle. So I remain quite skeptical. Sure. I'll try to get on earlier than usual. I got the Makarov in one of the Santa Containers and I have been quite impressed with it. For whatever reason, I could never get the Nurnberg to work for me, but this is the same freaking ship, and I can make it work wonders. It's a freaking blast in OPS! The last couple of nights I've been up late with work. Some of it's waiting for something to happen so I can squeeze a few matches in while I'm waiting. Sad to say it but, true dat. There are two things that I think are different. One good and one bad. (1) If you fail to protect the perimeter, the waves that spawn now don't seem to be as nasty as it used to be. The players are getting a break for once. (I've always had the same impression about the scenario since its launch. If you do well or have a good team during the first objective, things seem to go pretty well(easier maybe?). BUT, if your team isn't good enough to do the first objective.... The waves that spawn due to the failure trigger is even more difficult. So getting kicked while we're down. And I will concede that some of the possible Bot spawn deployments were badly thought out and that made it harder through RNG. This has been fixed quite a long time ago. (2) Fully equipped/19pt. BOT captains. This is an assumed global change for all scenarios. What I saw was a situation where the 2 Bot cruisers chasing our spawned CV, were doing ridiculous damage to it. I can only assume those cruisers shoot the CV, if absolutely no player is in sight?! And if they don't have anything else to shoot, the 2x Tier 6(Aoba,Nurn) cruisers took 30k off the Lexington's 57k in 30secs. With added fires and burning piling up, I would say they could easily nuke the Lex in 45-50secs which I think is a bit absurd... Never saw anything like that in the past, and I swear I remember seeing 2x Tier 7 cruisers spawning and chasing the CV before. (I think some balance needs to be looked at here. Sure..... a player should be around to take fire. But the damage potential doesn't seem right, regardless of that fact.) Correct me if I'm wrong, but you can potentially lose 2 stars from the Lex sinking? Now I haven't seen any official notes specifically on 19pt Bots, that have been cited by players. Only player discussions on the apparent improved capabilities and defences of the bots that they've noticed. And that the bots seem to have specific combination of skills, which means very high level capt. Fixed an issue with bots showing poor combat effectiveness in Operations. They will now operate with the required effectiveness depending on their tier as was initially intended at the release of the Operations mode. btw, what does the big green circle do? It's the inner defense ring. If an enemy ship crosses it, a) you don't get the reinforcing carrier, b) extra red ships spawn (I think), c) you lose a star.